This service product provides conversion of video tapes to Blu-ray Disc. Up to 9 hours of standard video from video tapes can be placed onto one video Blu-ray Disc. This is a great way to both modernize your collection of home movies, and reduce their physical footprint. The new Blu-ray Disc can be played in modern Blu-ray players (2009 or newer), Game Consoles, and new computers with Blu-ray Disc drives. 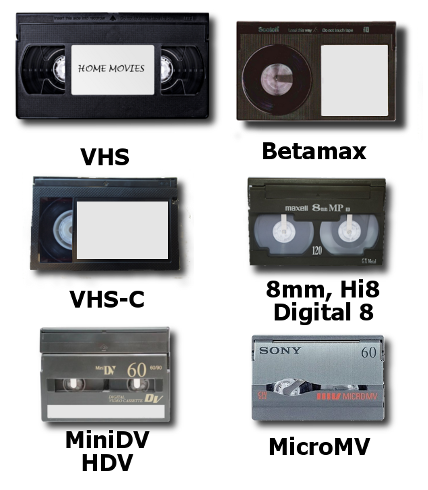 We provide digitization of video tape content and reformatting to Blu-ray Disc for the following list of tapes: VHS, VHS-C, BetaMax, MiniDV, HDV, MicroMV, 8mm, Hi8, and Digital 8 camcorder tapes. We can transfer PAL and SECAM tapes, too. Blu-ray Discs represent the best optical disc media currently available. They hold more video content (up to 9 hours), offer higher transmission speeds for playback of high definition video on HDTV, and are more durable (advertised shelf life of 70+ years). Average turnaround for your order is 2 weeks from receipt of your order into our lab back to your doorstep. Transfer price is $25 / tape. Quantity discounts available, starting at 10 tapes. PAL tapes carry a $10 per tape upcharge. Extra copies of the final Blu-ray Disc are $15 each. Each video tape is played in the appropriate tape-deck, its contents digitally captured by specialized software, and then reformatted into a new Blu-ray Disc. A Blu-ray Disc can contain up to 9 hours of standard definition video (MPEG-2), or up to 3 hours of high definition video (H2.64 MPEG-4). The disc is a BD-R manufactured by either Verbatim or Falcon, and has an advertised shelf life of over 70 years if stored properly. The disc is set up for auto-play with chapter points for every 20 minutes of video content unless specified differently. We combine multiple video tapes onto as few new discs as possible, with each video tape becoming its own chapter on the Blu-ray Disc. One (1) onscreen title is at beginning of the Blu-ray Disc, an example being “Smith Family Home Movies”. The table of contents has a motion icon for each video tape, and clicking on the icon takes the viewer to the corresponding chapter marker within the video content on the Blu-ray Disc. The one on-screen title, disc surfaces and case sleeves are labeled per your instruction. From Joanna Foreman of Denver, Colorado on 3/28/2016 . The staff at Cintrex AV was extremely helpful, knowledgeable, and communicative throughout the entire process. Top notch customer service, fast response time and they made every effort, going above and beyond to ensure complete customer satisfaction. Would highly recommend them for excellent quality work at a fair price. Will definitely use them again! Keep up the good work! From Tim P of St. Louis, Missouri on 1/19/2015 . You mentioned that you would keep our videos on file for 90 days and we could reorder a set for $30. If that is still the case, can we order 2 more sets for $60? Please let me know. Thank you!!! They turned out great! From Mike of St. Louis, Missouri on 6/19/2012 . Transferring the MiniDVs to Blu-ray Disc and MP4 files was the right combination of services, and Blu-rays looked great on the HDTV. Much impressed! Thank you.